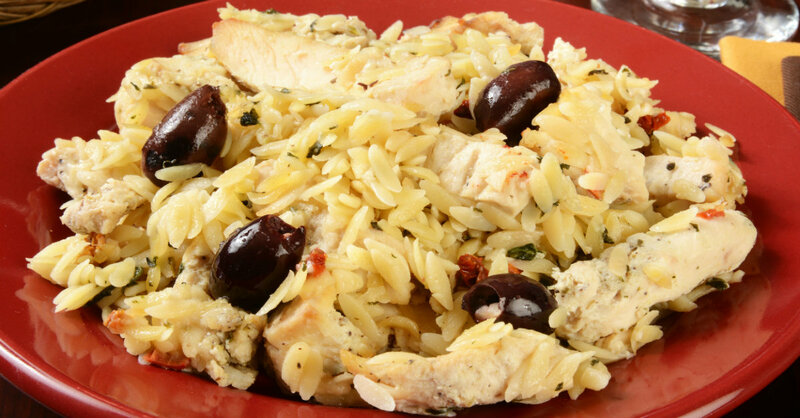 Hot Or Cold, This Mediterranean Orzo Salad Hits The Spot!! We’re always looking for weeknight dinner alternatives to pasta and we keep forgetting how much we love orzo! A rice-shaped, short-grain pasta, orzo is a perfect choice for cold, summer salads, but it’s just as good served hot…luckily for you, this dish can be served both ways! Packed with robust Mediterranean flavors, this dish is perfect for lunch or dinner, plus, it’s easy enough to make for a casual family meal, while still being a lovely choice for when you have guests. We’ve already had it twice this week, so we’ll let you get to it – can’t go wrong with this one! In a large Dutch oven or oven-proof skillet, heat 2 tablespoons olive oil over medium-high heat and brown seasoned chicken on all sides. Once browned, add in orzo, olives, sun-dried tomatoes, 1 tablespoon fresh oregano and Italian seasoning. Pour in chicken broth and stir everything together, then cover and bake for 30-35 minutes, or until liquid is absorbed and chicken is cooked through. In a small saucepan, heat remaining olive oil over medium-high heat and add lemon juice, zest and minced garlic. Cook for 2-3 minutes, stirring frequently, or until garlic is fragrant. Remove baking dish from oven, cut chicken into small pieces and drizzle lemon garlic oil over the top. Toss everything together and serve hot or cold. Garnish with remaining fresh oregano and enjoy!